COMPASSIONATE CLIMATE ACTION: I Finally Met One in Real Life! I met a real-live climate change denialist the other day. I've had a few run-ins with them before, but through letters to the editor, never in person. It was quite the experience! And I'll tell ya, he was a humdinger. Rude, arrogant, illogical, argumentative, and guilty of doing everything he was accusing me of doing. So, they really are like that! Wow. We're doomed. I was only on my third slide. Who interrupts a speaker on her third slide? He just broke in and started insisting that my facts were all opinions and that his "facts" were all correct. (I'm not sure I'd even presented any "facts" by that point!) And that I was slandering climate change deniers (a term I hadn't even used; regular readers know that I don't use that term anymore because deniers, er, denialists say it hurts their feelings). The atmosphere is cooling. There's no melting in the Arctic. Etc. He spewed such old, old craptrap. 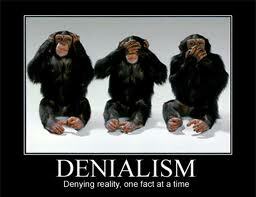 Why can't the denialists come up with any cool new stuff to show their ignorance of the science and the evidence? I'm not comfortable dealing with hecklers (this was not a polite contribution to the "discussion") and I know I got my hackles up, but others told me later that I handled it well. For their sake, I'm glad I gave that impression. But I still can't figure out what motivates someone like that to hold so tightly to the past. Why do some people need so vociferously to deny what's happening? We have [...] arranged things so that almost no one understands science and technology. This is a prescription for disaster. We might get away with it for a while, but sooner or later this combustible mixture of ignorance and power is going to blow up in our faces. On the way home, I found myself wondering what kind of teacher someone like that, someone who doesn't give a flying leap about their students' future, would be. Never mind. Based on his behaviour the other day, I suspect I know the answer to my question. p.s. Someone has reminded me that since the climate change crisis is already killing people and will lead to a holocaust ("destruction or slaughter on a mass scale"), climate change deniers are, in effect, holocaust deniers and have no right to get upset when others use the term "denier" to describe them.